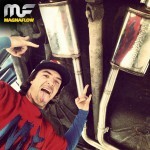 2010 Jeep Wrangler JK… MagnaFlow Equipped! SEMA 2012 (Day 1) MagnaFlow’s Revolver Girl Sabina Kelley Talks to the man behind the Revolver Richard Waitas at this years SEMA 2012 show in Las Vegas, NV. October 30th, 2012.